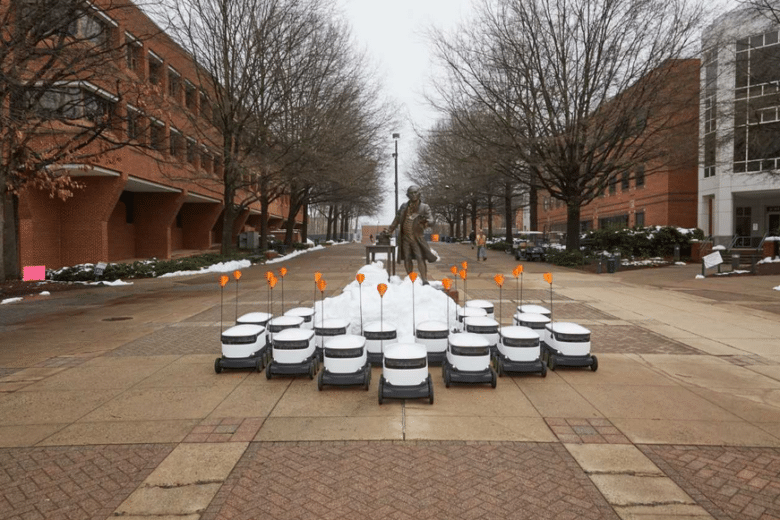 WASHINGTON — Box-sized robots are now delivering food to students and faculty on the George Mason University campus in Fairfax, Virginia. Food services and facilities management company Sodexo has partnered with Starship Technologies to deploy a fleet of 25 robots, the largest autonomous robot food delivery service on a university campus in the country. As of now, Blaze Pizza, Starbucks and Dunkin’ are on board for the robot launch. Sodexo said more restaurants will be announced in coming weeks. Students and teachers can use an app to place their order, which Sodexo and Starship say can be delivered in about 15 minutes. Each on-demand delivery costs $1.99. The robots are outfitted with multiple cameras that are always recording, and two-way audio to communicate with people they interact with. Each robot can carry up to 20 pounds — the equivalent of about three grocery bags. They drive autonomously, can navigate hurdles like curbs and can travel in rain and snow. But they are monitored by humans who can take control at any time. The service also works in conjunction with GMU student meal plans. Gaithersburg, Maryland-based Sodexo USA and Starship plan to roll out the robots on other college campuses in the future. London-based Starship Technologies, which opened a D.C. office in 2017, has been testing its Personal Delivery Device robots, or PDDs, in more than 100 cities worldwide since 2015, including a pilot program in D.C.’s Logan Circle last year. Last year the company raised $25 million in new funding.